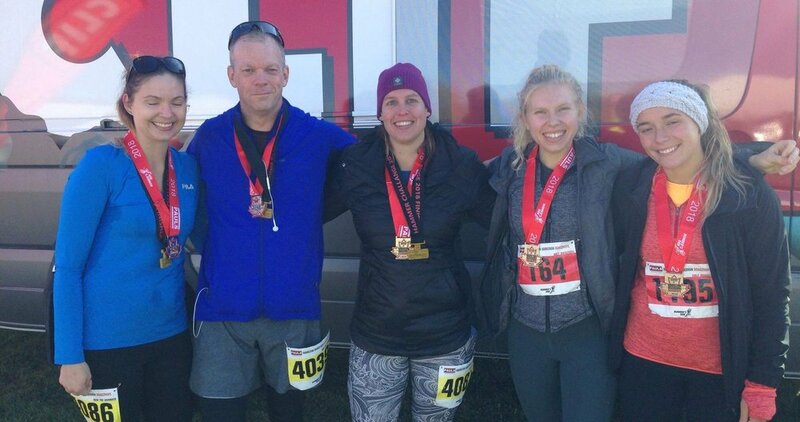 Well, a few of our members stepped up their game and took part in a weekend of Running. The Run the Hammer and Road2Hope event took place this weekend in Hamilton Ont. Member Tara took on the 5K and 10K on Saturday. 15K total marks her longest distance run in one day! Members Kristen, Scott and Kristy all ran the 5K and 10K on Saturday then returned on Sunday to take on the 1/2 Marathon. That is a total of 36.2K, pretty impressive if you ask me! Members Madison and Chelsea took on the 1/2 Marathon on Sunday. Congratulations, this was Madison first 1/2 Marathon, and she killed it. Chelsea also walked out with a 1/2 marathon PR. Please take a moment to congratulate these members when you see them next at the gym. Are you thinking about taking on an upcoming race or event? Did you know that CrossFit can help you prepare? Come check out our beginners class Friday at 6:30 PM or email us at info@crossfitdurst.com for more information.